The global weight management market was worth US$ 189.8 Billion in 2018. Weight management is the process of adopting lifestyle and dietary changes in order to maintain a healthy body weight. Most weight management strategies promote healthy eating and daily physical activity on the basis of the person's height, gender and age. The objective of weight management is to help the customer to achieve and stay at the best weight possible, with reference to his/her overall health, occupation, and lifestyle. The weight management programs consist of meal replacement products, low-calorie foods and beverages, weight loss supplements, low-calorie sweeteners, green tea/herbal tea, exercise programmes, surgery, etc. Increasing health awareness among consumers and rising occurrences of chronic diseases such as diabetes, obesity, high cholesterol, heart attacks etc., are among the key factors driving the global weight management market. Consumers are increasingly becoming health conscious and adopting nutritious diets and workout programs to stay healthy and fit. Moreover, the rising prevalence of obesity and overweight is also putting a major strain on the public healthcare budgets across the globe. This has resulted in governments and corporations taking initiatives to reduce the prevalence of overweight and obesity through incentives and wellness programmes. 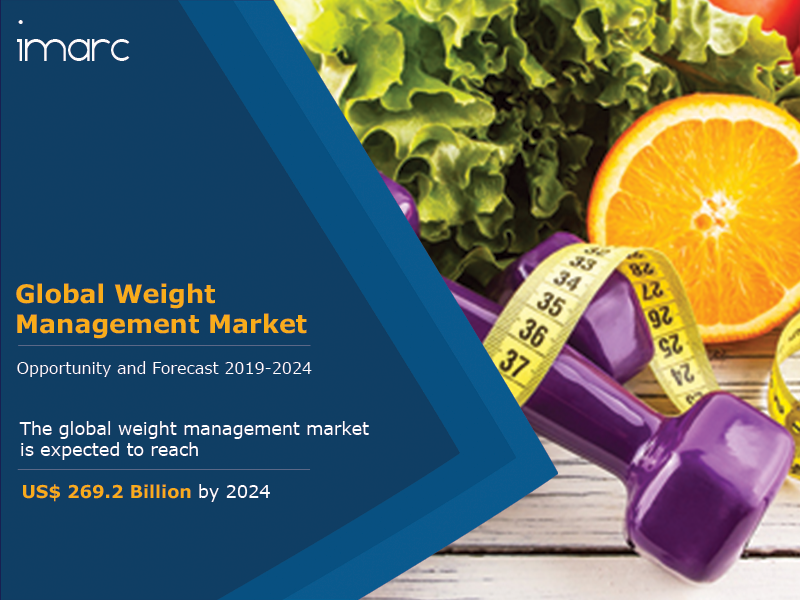 Other factors driving the global weight management market include increasing disposable incomes, changing lifestyles and dietary habits, technological advancements, etc. Looking forward, IMARC Group expects the market to reach a value of US$ 269.2 Billion by 2024, registering a CAGR of around 6% during 2019-2024. The report has also analysed the competitive landscape of the market with some of the key players being Hebalife International, Inc., NutriSystem, Inc., Weight Watchers International, Inc., eDiets.com, Brunswick Corporation, Ethicon Endo-surgery, Inc., Golds Gym International, Inc., Amer Sports, Technogym SPA, Jenny Craig Inc., Medtronic Inc., Kellogg Company, Atkins Nutritionals Inc., Apollo Endosurgery Inc., Cyber International, Inc., Johnson & Johnson, etc. How has the global weight management market performed so far and how will it perform in the coming years? What are the key regional markets in the global weight management industry? What is the breakup of the market based on the diet? What is the breakup of the market based on the equipment? What are the various stages in the value chain of the global weight management industry? What are the key driving factors and challenges in the global weight management industry? What is the structure of the global weight management industry and who are the key players? What is the degree of competition in the global weight management industry? What are the profit margins in the global weight management industry? 14.3.3 Weight Watchers International, Inc.
14.3.7 Golds Gym International, Inc.